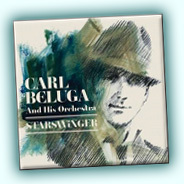 With his debut album "Starswinger", singer/songwriter Carl Beluga brings the golden age of popular music back into the 21st century. An all-original swinging sensation of exquisite music and explosive big band orchestrations! This debut album consists all the things you may have missed from the past, the stompin' rhythms, soaring brass and flying charts, combined with seductive melodies and romantic crooning! This stunningly fresh album delivers 12 ORIGINAL HOT SONGS written and arranged by Carl Beluga, and features Sweden's finest and "swingingest" players. All in all, a feel good record from a multi-talented artist, guaranteed to bring a smile to your face and a tap to your feet! Order YOUR Copy Today!! "Carl, every single track is simply great! "From Here To Jerusalem" ... cool beat ... I love "Leavin' Town" and "Your Intuition"! STARSWINGER is a wonderfully cool and swingin' record ... NO DOUBT!" "I received "Starswinger" today and I am simply floored. From the retro look to the covers, the great, swinging big band sound to the excellent original songs - you have a winner!" melt away the cold and blue feeling and lift me up. That timeless, crooning, lounging - that Frank Sinatra-tripping. Carl Beluga is all of the above, in addition to a bunch of newly written songs, that at least in a few cases, you think you've heard before, so close to the Great American songbook that they should be cliches, worn out and long-winded, but stand firm and glowing in the dark. Beautiful arrangements, elegant and captivating and very enjoyable. And look, a very pretty cover. A touch of class."